It’s time for What We’re Reading Wednesday hosted by Jessica over at Housewifespice.com. This week I’m working on Palace of the Twelve Pillars by Christina Weigand. Palace is the first in a trilogy. It’s super-high fantasy aimed at the YA crowd, but it’s certainly not written to turn off those of us, ahem, older adults. It’s rich in the feel of Tolkien or C. S. Lewis–a fantastical otherworld accessible to all ages. First off, the cover is GORGEOUS. I’ve not yet finished, but I can tell that in Palace, Weigand brings us a wealth of characters and a richly imagined world that is foreign enough to give our eyes fresh perspective but familiar enough that we can find our footing there without too much dissonance. I really get the sense that the author loves this place, loves these characters, and is passionate about telling their story. I’m also getting the sense that you won’t have to worry about handing this book to your YA readers and fear that they’ll find something untoward: the voice so far is pure dignity, pure class–VERY REFRESHING in this genre. 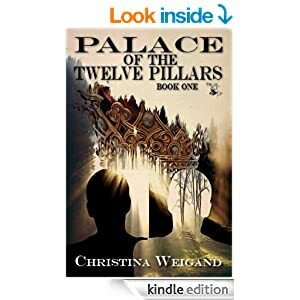 If you’d like to check it out yourself, please the Amazon Page for Palace of the Twelve Pillars and/or visit Christina Weigand’s author page. Thank you for letting Myrria and I visit. It was great fun. Can’t wait for you to visit the Dragon’s Lair next month.